Another segment of the California coast could soon be federally protected waters, as the Northern Chumash Tribal Council nominated a stretch of Pacific Ocean between Santa Barbara and San Luis Obispo to be declared a National Marine Sanctuary. The tribal council submitted paperwork to the National Oceanic and Atmospheric Administration (NOAA) Feb. 2. It is reportedly the first-ever public nomination for a stretch of California coast to be designated a marine sanctuary. “The unique coastline and ocean waters are the most beautiful in the world to the First Peoples and the communities that live along this ecologically rich, biologically diverse healthy coastline,” the tribal council stated in its nomination papers. The Northern Chumash Tribal Council stated the intent of its request is to protect the stretch of the central coast from fracking and oil extraction. There are currently four National Marine Sanctuaries in California, including three along the central coast and San Francisco Bay Area. The only National Marine Sanctuary in Southern California surrounds Channel Islands. It also is the only National Marine Sanctuary in California not protecting a mainland coastline; the eastern edge of the Channel Islands National Marine Sanctuary is a few miles west of the Ventura coast. As currently proposed, the Chumash Heritage National Marine Sanctuary would cover the California coast from Gaviota in Santa Barbara County to Cambria in San Luis Obispo County. 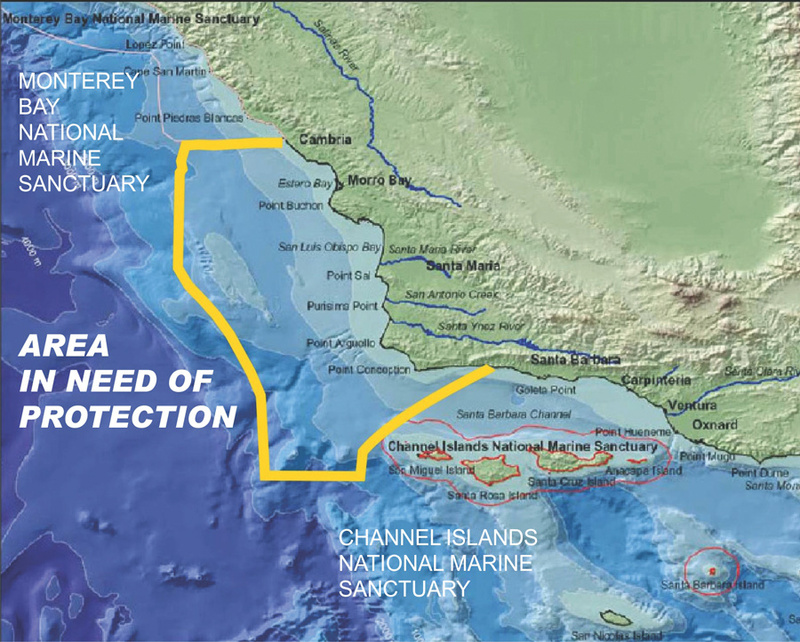 Portions of the Channel Islands and Monterey Bay National Marine sanctuaries border the sanctuary proposed by the Northern Chumash Tribal Council. It is unclear, however, whether approval of the tribal council’s nomination of the Chumash Heritage National Marine Sanctuary would prohibit recreational fishing along a stretch of the California coast between Channel Islands and Sonoma County. In a letter of support, Cambria Fishing Club President Jordan Pavacich said members of his group frequently fish in the Monterey Bay National Marine Sanctuary. However, some anglers say if the nominated sanctuary becomes reality, it would be bad news for recreational fishing. Several recreational fishers in the Facebook group “805 Anglers” believe the proposed sanctuary would mean a section of the California coastline would be closed off to anglers and result in a loss of fishing-related jobs in San Luis Obispo and Santa Barbara counties. One angler said the proposed sanctuary could make recreational fishing more difficult. He added if the Chumash Heritage National Marine Sanctuary becomes a reality, it could force recreational anglers and boaters into rougher waters between Point Conception and Point Sal. The NOAA still has to determine whether the Chumash Heritage National Marine Sanctuary meets its criteria for protection. If the criteria are met, the second phase of the nomination period, which would include a few rounds of public input, could take up to four years to complete. Public nominations of National Marine Sanctuaries were not allowed until 2014, after the NOAA received more than 18,000 public comments on the issue. “National marine sanctuary designation today represents empowerment of local stakeholders in the management of the offshore environments they cherish and depend on,” Shiva Polefka, research associate for ocean policy at the Center for American Progress, wrote in a recent column. According to the NOAA, the Florida Keys National Marine Sanctuary helped anglers in Key West increase their total annual catch from $40 million in 2001 to $56 million in 2011, a 40 percent increase. The sanctuary included a no-fish zone to help restore grouper and snapper populations. More information about the Northern Chumash Tribal Council’s nomination is available at nominate.noaa.gov/nominations/nomination_chumash_heritage.pdf.